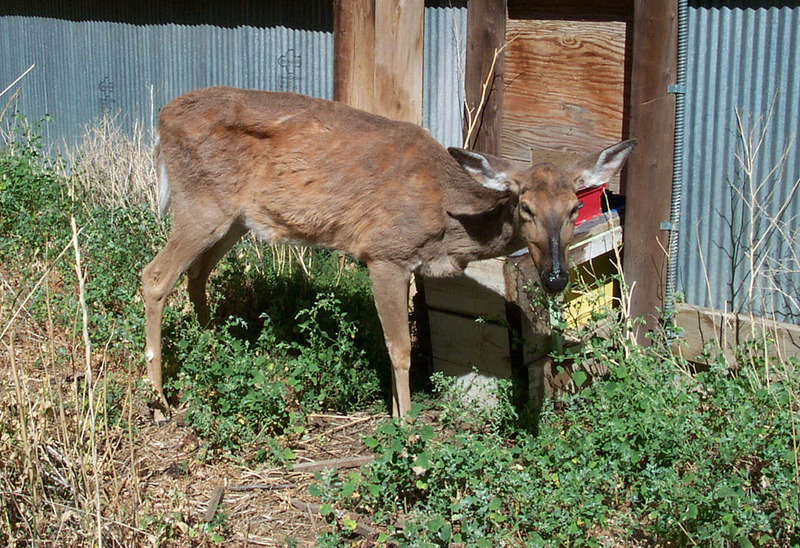 Chronic Wasting Disease is a nervous system disease similar to BSE. CWD is widely thought to be caused by an abnormally-folded protein called a prion; the folding makes it infectious. The prions collect in the brain, causing small holes to form and resulting in, among other symptoms, repetitive movement, teeth grinding, excessive salivation and substantial weight loss. More recently, it has been suggested that CWD may infact be caused by infection with the bacteria Spiroplasma, although supporting studies are lacking. TB, by contrast, is a bacterial infection of the respiratory system. CWD is a significant problem in the USA, where many deer are killed each year. Red deer, and possibly other species, are considered maintenance hosts for TB and this may have important consequences for activities aimed at tackling the disease in cattle. Chronic Wasting Disease (CWD) is a disorder of the nervous system and one of several diseases that we call Transmissible Spongiform Encephalopathies (TSE’s). The TSEs include diseases of sheep such as scrapie and the infamous ‘mad cow disease’ (bovine spongiform encephalopathy), a variant of which is suspected to cause Creutzfeldt-Jakob Disease (CJD) in humans. CWD is similar to BSE and scrapie, but affects only cervids (deer and elk). The cause of CWD was has remained frustratingly elusive, with suggestions of bacteria or an unconventional incomplete virus called a “virino” as culprits. Recently, Frank Bastiana, a neuroscientist at Louisiana State University, has championed the idea of a bacterial cause. This avenue warrants further study, but, at the time of writing, there is a broad scientific consensus that CWD is caused by an abnormally-folded protein called a prion. (Bastiana claims, incidentally, that Spiroplasma bacteria are present in every case of a TSE disease, while the prion is sometimes absent.) Prions seem able to resist the enzymes and chemicals that might normally breakdown infectious proteins, allowing them to collect in the brain where they can cause brain cells to die and the formation of microscopic holes in the brain tissues. There is an additional complication too, because such infectious prions can cause normal proteins to re-fold in their own image, leading to rapid increase in prion numbers. 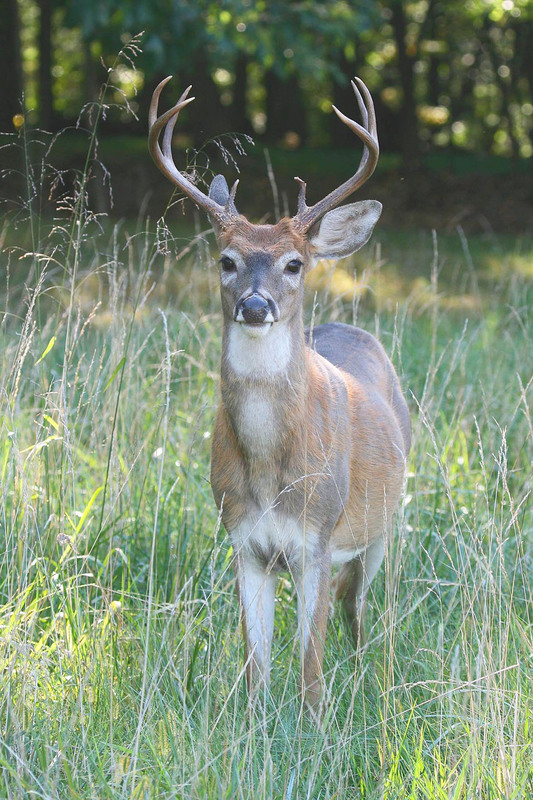 CWD is always fatal, and there is normally a long incubation period before the symptoms appear. Symptoms include weight loss, behavioural changes such as the deer isolating itself from its group, blank facial expressions, increased nervousness, excessive salivation, teeth grinding and repetitive patterns of movement. There are no reports of CWD from the wild in Britain, but the first European case was diagnosed in a female reindeer (Rangifer tarandus) from the Nordfjella population in southern Norway during March 2016. Since then, some 25,000 wild deer in Norway have been tested, 11 of which were found to be infected: seven wild reindeer from the mountains of south-central Norway, three moose (Alces alces) near the Swedish border and a single Red deer. CWD is currently a significant problem in the deer and elk populations of the United States. 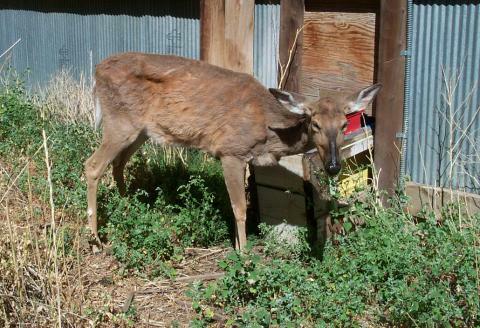 First identified in a captive mule deer (Odocoileus hemionus) in Colorado during the late 1960s, it has been present in wild deer herds since 1981. Wide-scale surveillance programs have led to a decline in 'reactions' (animals testing positive for the disease) in many parts of America, but recent lapses in surveillance have led to an increase in some states, including Alberta. According to an article in The Guardian newspaper, prior to the introduction of CWD surveillance in the US, in the Rocky Mountains of Colorado alone as many as one-in-ten deer and one-in-twenty elk were thought to be infected. At present, culling elk and deer, along with imposing fines for people feeding them (which draws deer from miles around and increases the potential for infection) are the only ways that authorities have found to get a handle on the situation. Interestingly, the prions identified from the Norwegian reindeer are very similar to those found in North American deer, suggesting they may have been imported with deer products from the USA. Importation of infected elk (Cervus canadensis) from Canada during the mid-1990s resulted in outbreaks in North Korea during 2001, 2004 and 2005. The prion isolated from the moose was new, possibly a spontaneous mutation, and characterisation from the Red deer is still underway. Given the known migratory patterns of moose, authorities are concerned there is a high probability that the disease will spread to Sweden, if it hasn’t already. Contrary to popular misconception, there is currently no evidence that CWD can be transferred to humans, although the consumption of meat from infected animals is not advised and hunters are advised to take precautions when preparing/dressing their carcasses. Tuberculosis (frequently shortened to TB) is an infectious bacterial disease that most often attacks the lungs. The most common form of TB is caused by the bacterium Mycobacterium tuberculosis, although there are various species and subspecies of Mycobacterium that can cause different forms of the disease. Bovine TB (bTB) has been documented in wild deer, the first incidence being on a deer farm in 1988, but cases are rare. In Mammals of the British Isles: Handbook, 4th Edition, Brian Staines and his co-authors note that there is only a single ‘hot spot’ of bovine TB in wild deer in southwest England, where deer densities are unusually high, and a single record from Scotland. Indeed, a survey of mammal carcasses collected by the Food and Environment Research Agency in York confirmed bovine TB in 1% of the Red deer (Cervus elaphus) specimens, although the report did conclude that Red and Fallow (Dama dama) posed the greatest threat of transmitting the disease to cattle and that the gregarious nature of these species is likely to aid the spread of the bacteria. The disease causes damage small lesions (cuts) in the lungs and lymph nodes of the deer – different species get different patterns of damage, which in turn affects how the disease can be passed to other animals. A study of the patterns of these lesions in 35 Red deer shot by hunters in France led Gina Zanella at AFSSA (France’s equivalent to DEFRA) and her team of epidemiologists to conclude that Red deer were more likely to spread the disease to other animals than wild boar were. Unlike boar, deer react to bTB infection by forming abscesses, which provides some resistance to the disease (i.e. they survive longer with the disease than boar) and makes them a ‘true host’. Work by Andrew Paterson at DEFRA suggests that the gross lesions associated with bTB in Red deer are an advanced feature of the disease, meaning that they can be infected with the tuberculosis bacterium without showing any visible signs. Paterson also observed that the features associated with bTB infection can sometimes be confused with infection by other Mycobacterium species, such as Avian TB and Jöhné’s Disease. Bovine tuberculosis is a notifiable disease in Britain, meaning that by law even suspicion of infection must be reported to the Local Authority and Health Protection Agency. Curiously, however, there is currently no statutory surveillance of TB in farmed, park or wild deer of any species in Britain. In their Handbook chapter, Staines and his co-workers go on to point out that there are a ‘handful’ of bTB cases from Ireland. Indeed, 13% of Red deer culled in Northern Ireland between 1996 and 1997 tested positive for the disease, as did nearly 3% of the 340 deer culled in an Irish national park during 1997. Bovine TB seems more prevalent in deer outside of the UK and a survey of Red deer and wild boar killed during the 2001/02 hunting season in Normandy, France revealed that both species were ‘heavily infected by M. bovis’. Paratuberculosis (PTB), a chronic inflammatory disease of the intestinal tract, has also been recorded in deer. The disease-causing agent is the bacterium Mycobacterium avium paratuberculosis, which lives in the intestinal cells and lymph nodes, causing progressive thickening of the intestinal wall. PTB is an incurable wasting disease, variants of which affect humans and livestock. According to a paper published in the Journal of Wildlife Diseases during 2002 by a team of scientists at the Universitat Autonoma de Barcelona, PTB was found in a population of about 1,000 free-ranging Fallow deer between 1997 and 1998 in Spain. Five of the eight deer studied had diarrhoea and lung lesions, and M. a. paratuberculosis was cultivated from two. It should be noted that the incidence of TB in deer is very low, as are records of deer carrying anthrax, foot-and-mouth disease and Lyme disease.